We recently moved the three year old out of his crib and into a twin bed. I knew I wanted it to stay in the nautical theme of his nursery (I’ve shared the full reveal of his room before) and I wanted to add a light to it because all my kids love reading in bed. This is what I ended up building and I’m so excited with how it turned out. It fits perfectly into his room, with the blue grey color and the best part is that it has a full sized pop-up trundle underneath for if we ever have sleepover guests! Plus adding the light makes it even more special. The design is inspired by this bed I found on Post Tots. The original $2000 price tag was a little rich for my blood. Especially since it wasn’t as nautical as I wanted. I loved her arch, but needed my version to be taller and the arch to be higher since I wanted to add the light (and it couldn’t hit you in the back of the head when you were in bed.) I used beadboard instead of shiplap (sorry JoAnna Gaines) since tthatand I wanted the vertical sides to be more like “posts” than just plywood. Her project was only a headboard, this was actually a freestanding BED. 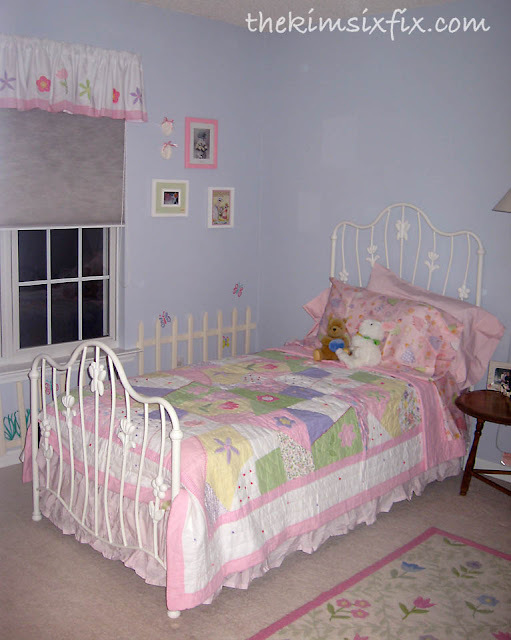 I also used her plans to make a footboard that matched. I needed to build more than just a headboard, since I was repurposing the super girly butterfly bed from my older daughter. The head board and footboard had flowers and butterflies, and I knew I couldn’t reuse them, but the actual mattress support was fine. It just needed legs and a head board and footboard. Here you can see how I used the old frame with a couple of bolts onto the new headboard and footboard. I’m not sharing exact measurements since it was all based on the existing frame. My measurements were slightly different than Elisha’s but it you were building your own version, you would want to use plans like this version from Ana White. As for the color, I first primed everything using my Homeright FinishMax and Zinsser Primer. I ended up choosing Nautical Star (but Pittburgh Paint) as the perfect paint color. It is a grey but up against my navy and blue walls it looks quite blue. I got the Montgomery Wall Sconce from Joss & Main. It was only $35 but it was a hard wired fixture I’ll share how I converted it to a plug in and attached it to the bed in a future post. I made sure the bed was tall enough so that it could accommodate a pop up trundle (which was originally under the butterfly bed). What is so great about it is that it is on springs so it is full height once it pops up. It is perfect since we often have to use this room for guests. The bedding set also came from Joss and Main (They sell a really inexpensive similar one at Target). I loved that this one is trimmed with Jute, which matches a lot of other features in the room. The sheets, which feature architectural schematics of sailboats came from Homegoods. He loves his new ‘big boy’ bed and doesn’t want to sleep anywhere else. And I’m really proud that I could build it for him. I know he will be using it for a while!